The history: One of the oldest known Ganesh pandals in the state, the Lalbaug Sarvajanik Utsav Mandal, Ganesh Galli started the festival in 1928 to inspire people to fight for their rights in the pre-independence era. Throughout the 10 days of the festival, after the evening pooja, the organisers would host plays like the Ramayana and Mahabharata and screen regional movies to raise awareness about India's rich culture and various art forms. In the year 1977, the pandal entered its 50th year and to celebrate the occasion, erected a 22 ft idol, which went on to become the first biggest Ganesh idol in the whole of Maharashtra. While the record was subsequently broken by Khetwadicha Raja in the year 2000, the organisers have ensured to keep the idol well over 20 ft since then. This is despite the BMC issuing a warning to restrict the height of idols to 18 feet. The idol this year: The 22 ft idol designed by Biharilal giri and 200 workers is set against the backdrop of Pashupathinath temple, Nepal. The entrance to the pandal features the 12 famous jyotirlingas in the country. "A lot of people in our country are religious and due to lack of time and resources are unable to visit the sacred places. Every year, we attempt to replicate one of these temples to make people aware of our culture and heritage and also give them a real-life experience of visiting the place," shared Swapnil Parab, secretary to the mandal. The history: In 1928, Ramchandra Tendulkar, who was the Mandal's treasurer at that time, started the Ganesh Utsav in the Nikadvari Lane. 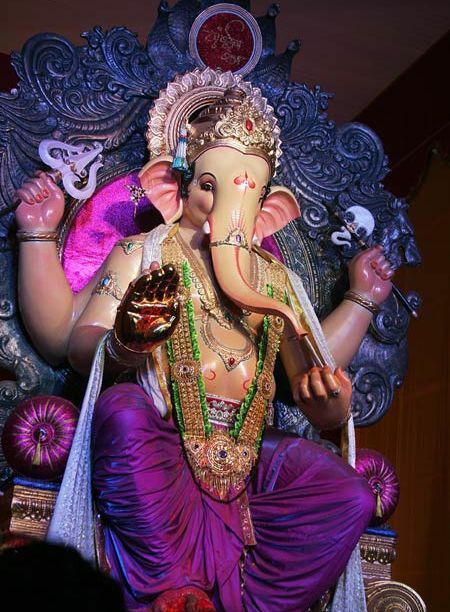 The speciality of the Ganesh idol at Girgaon is that it is one of the few idols in the state that is made out of clay. Unlike the regular idols which are made out of Plaster of Paris, the Girgaoncha Raja is made of Shadu clay, a special type of clay which is imported from West Bengal and is also used to make Durga idols for the Durga pooja. Another tradition here is that since the last 85 years, the Patkar family is in charge of making the idols, which are peculiarly over 20 feet in height every year. The idol this year: This year, too, the idol is 21 feet high and is sculpted by architect Rajan Patkar. The idol weighs 2 tons. Sanjay Harmalkar, the secretary to the Mandal informs me that they want to spread the message of eco-friendliness through their clay idols. "Every year, after the immersion, we see so many fragments of PoP Ganeshas in the sea. Not only is it disrespectful to the idol, but it is also harmful to the environment. The cleaning up also takes longer time. Although difficult to make, the advantage of clay idols is that they melt easily during immersion. On behalf of my Mandal, I'd like to request everyone to choose eco-friendly Ganeshas over PoP ones," says Harmalkar who has been using the mandal's Facebook page to spread this message among young people. The history: In 1932, a temporary but prime market place in the Peru Chawl area of Lalbaug was shut down by the government. The fishermen and vendors who lost their livelihood decided to pray to Ganesha to help them with a permanent place to do business. Thanks to the efforts of a few councillors in the area, a new market was constructed in the same place. In celebration, the localites formed the Sarvajanik Ganeshotsav Mandal in Lalbaug in 1934. The first Ganesh idol was incepted on September 12, 1934. Since then, the mandal is thronged with visitors throughout the 10 days of the festival. 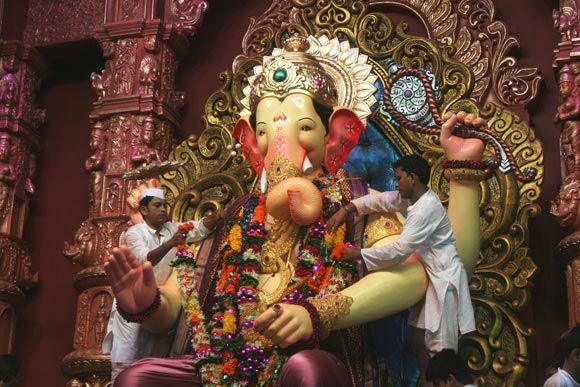 The idol this year: The Ganesh idol this year stands 12 feet tall and took two months to be ready. Santosh Kambli, who sculpted the idol this year, belongs to the third generation of architects responsible for the patented design and decorations of the Raja. The cost of the idol is Rs 60,000, but the decorations and other arrangements work up to 17 lakhs. During the 10 day event, the pandal is visited by over 1 crore visitors every year and on weekends, organisers inform that it becomes difficult to accommodate people in the 3 lakh sq ft area surrounding the pandal. 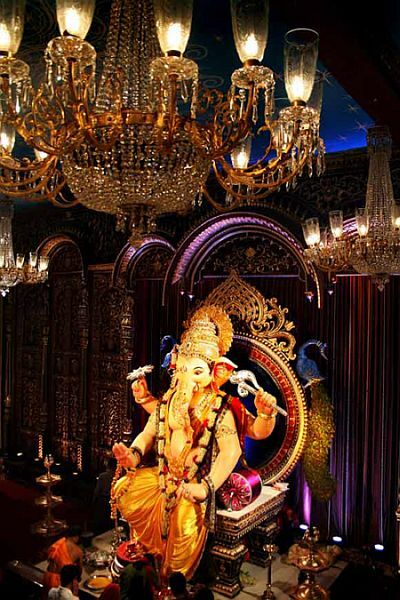 Lalbaugcha Raja is also one of the richest Ganeshas in the whole of Maharashtra. "Our every day collections sometimes round up to a crore. Just yesterday's collections touched 85 lakhs," informed Rajendra Lanjwal, treasurer of the mandal. Lanjwal reveals that the money thus collected is utilised for social purposes under the initiative titled Lalbaugcha Raja Prabhodini. 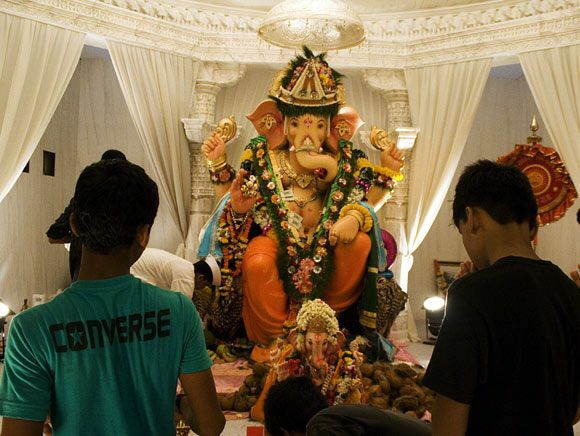 Some of the projects financed under the Lalbaugcha Raja Prabhodini include the Sane Guruji Abhyasika (a place for children to study), Swatantryaveer Savarkar Library, Sant Dnyaneshwar Reference Book Bank, Swami Vivekanand Scholarship (Scholarships for poor and deserving students) and Competitive examination counselling centre (to prepare students for IAS and IPS exams). The history: When the Khetwadi Mandal was incepted in 1959, it had humble beginnings. However, in 1984, the members of the Mandal started collecting one rupee coins as donation towards their dream of making the largest Ganpati in the state. With each passing year, the height of the Ganesh idol rose from 28 to 35 feet high. In the year 2000, the Khetwadi Mandal fulfilled their long cherished dream and created history. 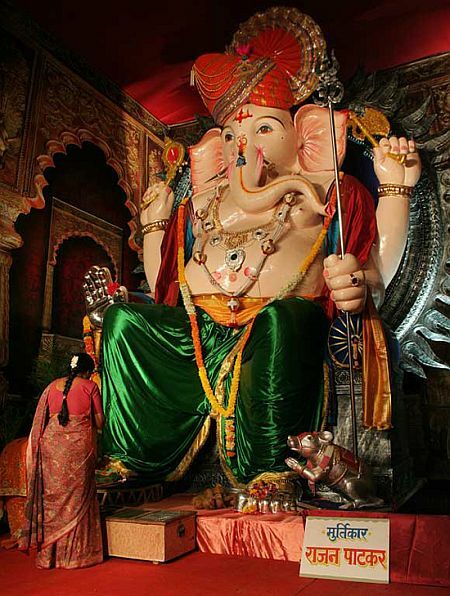 They made the highest idol of Ganesha -- a whopping 40 feet high statue replete in Parshuram Avtar, which is claimed to be the highest idol of Ganesh in the Indian history. The idol this year: The organisers have tried to recreate Mumbai's Hare Rama Hare Krishna temple this year. The 15 feet tall idol is made from Plaster of Paris and is adorned by jewels and accessories made of pure gold. 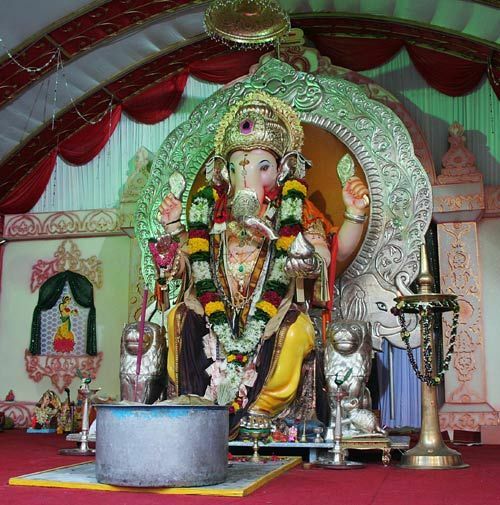 It is designed by architect Raju Shinde and claims to be the fourth richest Ganesha this year next to GSB Seva Mandal, Sion, GSB Sarvajanik Ganeshotsav Samiti, Wadala and Lalbaugcha Raja. Over 100 workers have assisted Shinde in completing the idol, which cost the Mandal Rs 1, 20,000. "We spent close to Rs 40 lakhs on the decorations and theme," added Ranjeet Mathur, President, Khetwadi Mandal. In the past, this Mandal has recreated themes like the Sheesh Mahal (palace of mirrors), Raj Mahal (Palace of the King), Swarg Mahal (Palace in Heaven) and Deep Mahal (Palace of Lamps). The history: The Goud Saraswat Brahmin Samaj started the festival in 1955 with the sole aim of uniting the Goud Saraswat Brahmin community in Mumbai. Over the years, it is said to have answered the prayers of lakhs of people from different communities which went on to attract visitors from various parts of Mumbai. While some of them rewarded in cash, others donated gold and coins to the deity. In the year 2011, the GSB Samaj sought an insurance cover of Rs 222 crore for the idol. Needless to say, the GSB Samaj Ganesha is known to be the richest deity in the city. The idol this year: The 8-feet high idol adorned in gold and jewels donated by its visitors is a sight to behold. "We offer various poojas for our visitors throughout the day at subsidised costs. Everyone is equal before God and it is our duty to spread the message through the festival. We want people to experience peace and divinity while they are here," shared NN Pal, trustee chairman, GSB Sarvajanik Ganeshotsav Samiti, Wadala. The history: In 1962, a few residents from Bhandarkar Road area came together to start the festival and promote a social cause. Unlike the other Ganesh pandals which collect money from locals and residents for the festival, the Bhandarkar Road Sarvajanik Seva Samiti works in peculiar way. "We don't go door to door collecting money. Whatever money comes through donations is used to make the idol. Even the jewels and throne are not owned by the mandal. There are some noble people who have agreed to contribute to it. After the festival, they take it with them and provide it again the following year," informs Rajendra Verma, a committee member who has taken leave from work to look into the arrangements. 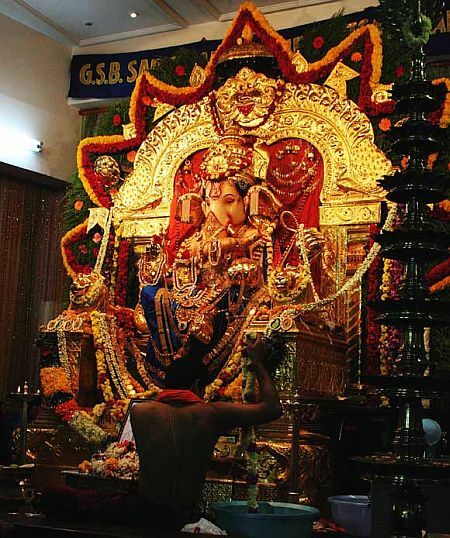 The idol this year: The 11-ft idol designed by Ashok Parab stands in a busy street in Matunga. Every child who visits the idol is offered a chocolate bar instead of sweets. Each evening through the 10-day festival, after the 8 pm aarti, the Samiti provides food to over 20,000 people, most of whom include poor children from the slums. The nearby locals have also allowed them to use the building space below to let senior citizens enjoy the meal in peace. The history: About 47 years ago, a few factory workers had moved from Lalbaug area of Mumbai to settle in the western area of Andheri, Mumbai next to their respective factories -- the Golden Tobacco Company, Tata Special Steel and Excel Industries Ltd. These people, missed visiting and celebrating the Ganesh festival in Lalbaug and hence started the Azad Nagar Sarvajanik Utsav Samitee in 1966 with the festive aim in mind. Over the years, it has replicated various themes in its pandal which include famous temples like the Akshardham, Somnath, Mangueshi and Saras Baug. The idol this year: This year Andhericha Raja has replicated the Jain Dilwara temples of Mount Abu, Rajasthan. The idol has been designed by Raju Savla whose family has been entrusted the responsibility of making the Raja since three generations now. Besides Savla, over 50 workers have contributed towards readying the pandal in two months. The decoration has alone cost over Rs 30 lakhs, informed a committee member of the mandal. Unlike the other Ganeshas that are immersed on Anant Chaturthi, this is the only Ganpati which is immersed on Sankashti, which falls five days after Anant Chaturthi. Like the Lalbaugcha Raja, even Andhericha Raja is a wish fulfilling one, and is visited by over 10 lakh people every year.